Purchased in 1968 by Lyle and Mary Rizor, Rizor Nature Sanctuary was originally supposed to be an ideal place for the couple’s retirement home. After recognizing the natural beauty and importance of these 30 acres, the couple generously donated the land in 1977 to the MNA for it to remain in its natural state forever, and established the first MNA sanctuary in Livingston County. Formerly known as Shannon Nature Sanctuary, the name was changed in 2003 to honor the couple who loved the land enough to protect it. Near US-23 and easily accessible from the Shannon Glen subdivision, Rizor’s streams and varying habitat offers huge rewards for those who come to explore. 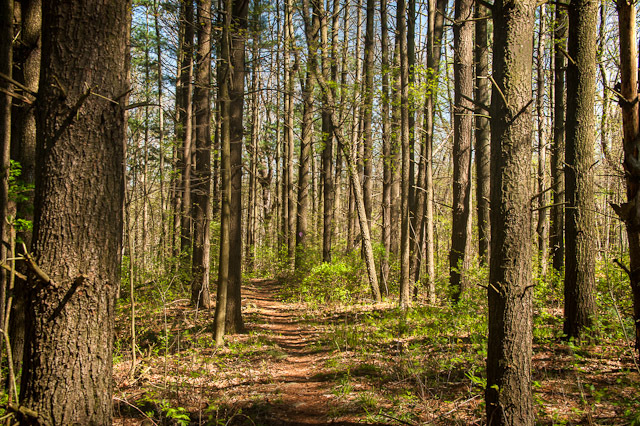 Two well-marked trails, totaling roughly one mile, take visitors through eight different types of habitats that support an abundance of wildlife. Wildflowers flourish on the southern side of the sanctuary, where wild blue phlox, bloodroot, and hepatica are among the colorful wildflower species. Running through much of the sanctuary is Cornell Creek, one of the centerpieces of Rizor Memorial. 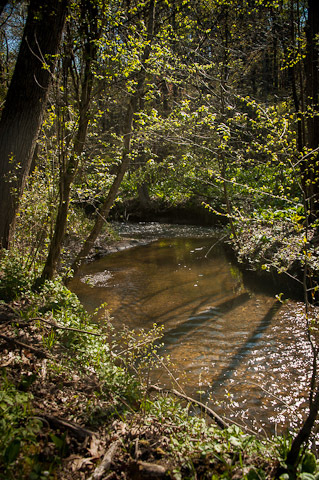 Its swift, clear water and hard sandy bottom can easily be mistaken for a northern trout stream. White oak and blue beech are present in the floodplain habitat, amongst numerous different native Michigan tree species. Thanks to the kind donation by Lyle and Mary Rizor, the forest and scenic creeks will be protected for the enjoyment of visitors for years to come. In the spring, visitors are treated to a vast array of blooming wildflowers. The wild blue phlox (Phlox divaricata) can be easily spotted by its bright blue, lavender, or white petals. Most common in the Midwest, these fragrant flowers have five notched petals and grow between 8 and 18 inches tall. Wild blue phlox can commonly be found growing in clusters and hidden in shady areas of hardwood forests. Visitors will also immediately notice the interconnected stream system running through the sanctuary. A trail running along the west edge of the sanctuary follows the shores of the North Ore Creek. Here, visitors commonly spot waterfowl and other wildlife that rely on the waters. Running into the North Ore is Cornell Creek, which bisects the sanctuary. North Ore Creek drains into the nearby Lake Shannon, which can be seen on the west side of the sanctuary. This is part of the Shiawassee River watershed. The trail bordering the eastern side of the sanctuary brings visitors through a small pine grove. These evergreen plantations were planted around 1937 and have been a characteristic of Rizor ever since. Planting of pine stands was a common wildlife management practice at the time, which promoted soil conservation by restoring old farm land or clear-cut areas. The trees also provided nesting and roosting sites for owls and songbirds such as finches and warblers. The plantation at Rizor Memorial is primarily Scotch pine, but also includes red pine and eastern white cedar. April and May are the best months to visit Rizor Nature Sanctuary, as visitors will be treated to a vast array of wildflowers. Northbound US 23, exit #70 - Clyde Road. Cross over expressway to service road (Old 23). Turn right (north) onto Old 23 and drive north 2 miles to Faussett Road. Turn left (west); drive 3/4 mile to Shannon Glen subdivision. Turn left (south) into subdivision and follow River Walk Drive to cul-de-sac. Park on cul-de-sac near chain gate and walk (south) on two-track road to sanctuary entrance. For southbound travelers, take US 23 to exit #75 - Center Road. Turn right onto Center Road, then turn left onto Service road (Old 23). Follow that south 2 miles to Faussett Road; turn right (west) and follow as above to the sanctuary.